Novel reformulations by Superconductors.ORG, have seen the Tc of YBCO increase significantly since 2005. However, an anomaly has recently appeared in tests of some of these new materials that deepens the mystery of high-temperature superconductivity. The graphs at page top show both resistance-v-temperature and magnetism-v-temperature of the recently discovered superconductor Y358 (structure shown at left). 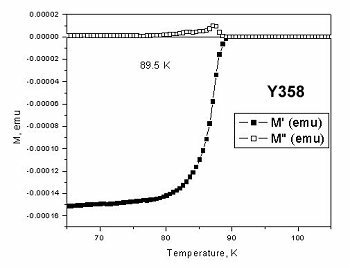 While pristine YBCO produces resistive and magnetic Tc's at nearly the same temperature, the Y358 plots are more than 15 degrees apart. 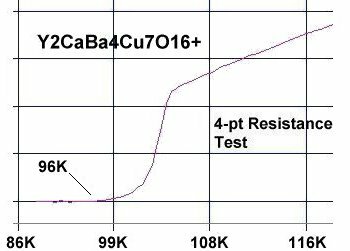 After copper doping, resistance reaches zero ohms near 104K. Yet the onset of diamagnetism remains static at 89.5K. 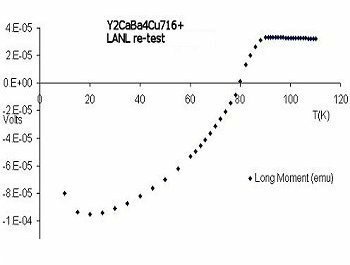 This unusual behavior was also found when YBCO was doped with calcium to increase Tc. 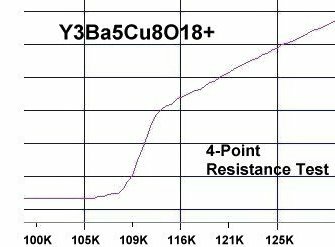 The below plots of Y2CaBa4Cu7O16+ show resistive Tc increasing to 96K with calcium doping, while the magnetic Tc essentially remains the same as that of pristine YBCO at 89.5K. Although puzzling, this is not necessarily bad news for manufacturers who have been struggling with a drop in Tc when they dope YBCO with calcium. Calcium doping of YBCO can increase the current across grain boundaries by as much as 35%. This discovery confirms there is no Tc drop in Y2CaBa4Cu7O16+. Since this unusual behavior only appears to be a characteristic of superconductors with copper chains, the non-C axis copper planes may be the source of the anomaly. The copper chains along the C (vertical) axis produce CuO planes when viewed from the A and B axes, as shown below. The copper doping and calcium doping of YBCO only produces a change in planar weight relationships along the C axis. (Higher planar weight disparity equals higher Tc.) While the weight relationships of the planes along the A and B axes remain the same. The net effect of this is comparable to a multi-phasic superconductor, where the drop to zero resistance of the highest Tc phase is seen as the bulk Tc. However, the magnetic response of a multi-phasic superconductor is not global. Just as flux lattice vortices and stripes form to suppress superconductivity on the surface of Type II superconductors, the C axis magnetic Tc may be suppressed by the interwoven A and B lattice superconductivity. Whatever the cause, the mystery of high-temperature superconductivity deepens with this discovery.